Android fared better when users were asked solely about software, as 55 percent said they would stick with Google's mobile platform. But an additional 31 percent of Android users also indicated they are likely to switch to an iPhone for their next handset, leaving Apple a sizable chunk of Android users. UBS analysts remarked that Apple's retention rates have held up "incredibly well," even as the market share of the iPhone continues to grow. In fact, when looking solely at consumers who plan to switch smartphone makers, Apple is a huge net beneficiary. More than 50 percent of those looking to switch plan to buy an iPhone, while just 10 percent of switchers plan to ditch the iPhone. The survey shows Apple as only one of three net beneficiaries in the market, as the poll suggests Samsung and HTC will narrowly add more customers than the number they lose. Users did indicate that they intend to leave RIM and Nokia smartphones in droves. 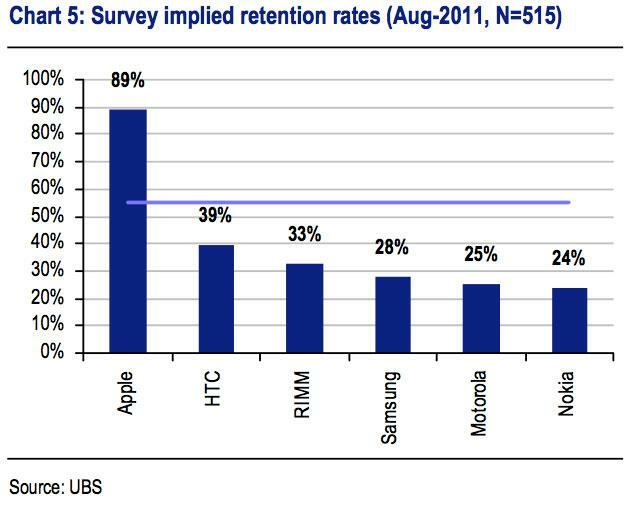 The "stickiness" of Apple's iPhone is viewed by UBS as a "worrying" trend for Nokia, RIM and Motorola. They believe the success or failure of the recoveries of both Nokia and RIM will depend on the ability of Android to generate "sticky" customers. UBS's survey polled 515 customers with a focus on international high-end consumers. The investment firm has reiterated its "buy" rating for AAPL stock, with a price target of $510. "Demand for iPhone, iPad and MacBook Pro remains robust, with a leading ecosystem that creates sticky demand," they said. "We believe new opportunities such as TV sets are not factored in by the market and we view the valuation as attractive."